JAN 25, 2019: ETUDE TRANSCRIPTIONS UPLOADED! 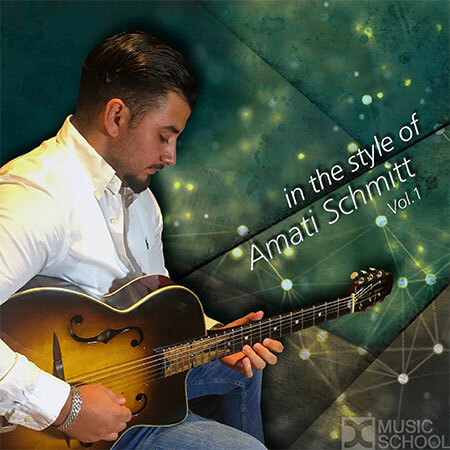 An in-depth study on the Gypsy Jazz style of guitarist Amati Schmitt. -Lessons where Amati shares his approach to music. Sonny Amati Schmitt, one of the sons of Gipsy Jazz legend Dorado Schmitt, was born on 8 August 1995 in Thionville in Moselle. He started studying piano and solfeggio at the age of six, but at the age of eight, he couldn’t resist the attraction of the guitar, honoring his origins. His technical progress on the instrument was spectacular, thanks to the advices of his father and of course, his talent. At the age of nine, he joined his father on stage for the very first time. By the time he was 15, his reputation had already spread way beyond national borders. As his father’s worthy heir, Amati already has some sound concert experience behind him. He appeared alongside Dorado in the Jazz in Vienne Festival in 2010 and for six days of the Django Reinhardt Festival he played at New York’s Birdland Club, where he was congratulated by Leonard Di Caprio, who’d gone there specially to hear him. Several of the well-known jazz strongholds have booked him, e.g. the Festivals of Lyon, Monaco, and Colmar, not forgetting the New Morning in Paris.